The death has taken place on 30 October 2013 of Fr William (Liam) Burke at the St Theresa’s Nursing Unit in the African Missions, Blackrock Road, Cork. Liam Burke, son of Thomas and Elizabeth (née Vigors) was born in Carrenroe, The Rower, Co Kilkenny on 3 October 1926. He was baptised the following day in Inistoge parish church, diocese of Ossory. He was also confirmed there thirteen years later (14 April 1939). Liam was the eldest of six children: Martin, Maureen Prisciak (Canada), Seán (died 1980), Sr Breda (Mercy Congregation) and Tommy. He attended The Rower National School and did his secondary studies (1941-1946) at the Good Counsel College, New Ross. In September 1946 he went to the SMA College at Cloughballymore, Kilcolgan, Co Galway where he completed his Philosophy studies in 1948, taking his First Oath of membership in the SMA on 29 June 1948. He did his theology studies at the African Missions College, Dromantine (1948 – 1952), becoming a permanent member of the Society on 11 June 1951. He was ordained a priest on 18 June 1952 by Bishop Eugene O’Doherty of Dromore diocese in St Colman’s Cathedral, Newry, one of ten SMA priests ordained on that day. He was appointed to serve in Kaduna Prefecture in Nigeria. In 1953 Kaduna became a diocese and in 1959 was raised to the status of an Archdiocese. Fr Liam was to serve under two Ordinaries in Kaduna: Bishop (later Archbishop) John McCarthy [from Castlehaven, Co Cork] and Archbishop Peter Yariyok Jatau [the first Nigerian Archbishop of Kaduna]. 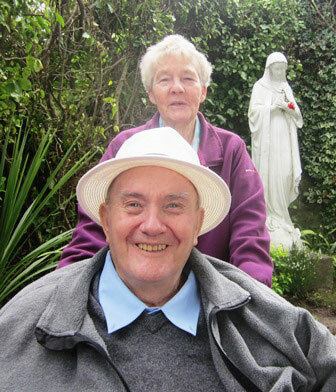 Fr Liam with his sister, Sr Breeda, in the garden at Blackrock Road in July 2013. During his service in Kaduna, Fr Liam served in several parishes, including Minna, Kontagora, Zuru, Gawu, Guni, Zonkwa and different parishes in Kaduna City. Minna is now a diocese and Kontagora an Apostolic Vicariate whilst Zonkwa is part of Kafanchan diocese. From the original Kaduna Prefecture in 1952 there are now 5 dioceses and the Archdiocese of Kaduna, surely a sign of God’s blessing on the work of the missionaries and local clergy and people. He had a Social Development Committee which brought together the leading Catholic people in Kaduna, working together to help the people of Kaduna, no matter there religious affiliation. An interesting sidenote is that Fr Seán Healy SMA – of Social Justice Ireland, a leading voice on Social Justice in Ireland – ‘cut his social development teeth’ on this Committee during his years in Nigeria. 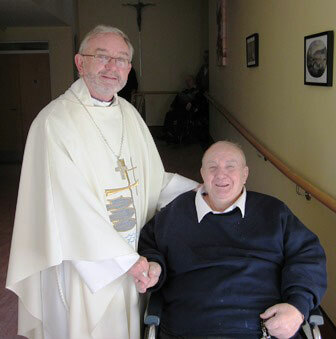 Fr Liam with Bishop Kieran O’Reilly SMA of Killaloe diocese during his visit to Blackrock Road in 2012. Fr Liam was a man who got to know and became friends with many of the local Islamic leaders and Imams. In an era before Christian-Islmaic relations were spoken of, Fr Liam was already cultivating such relationships. He was on very good relations with State and Federal Government officials and was able to use such contacts to ensure that the Catholic voice was heard on issues affecting the country. 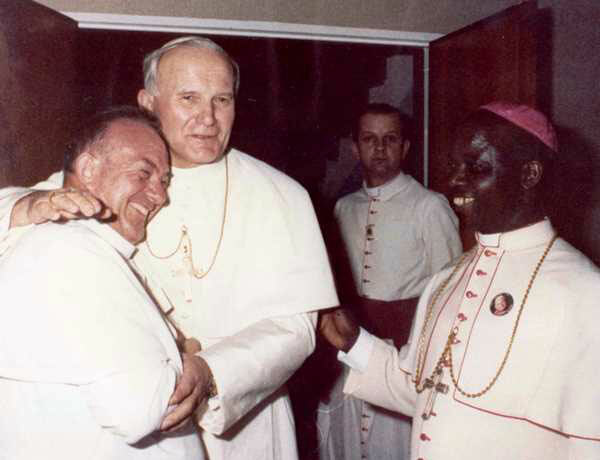 The one event which will be forever associated with Fr Liam Burke was the visit of Pope John Paul II to Kaduna in February 1982. He is pictured above with the Pope and Archbishop Jatau. He was heavily involved in the organisation of that visit and has many pictures and memories of that historic occasion. In 1999, after officially returning from Nigeria, Fr Liam presented a copy of a 12th century Russian icon to the Society. It was a gift he received from the Neo-Catechumenate Way in Kaduna with which Fr Liam was closely associated. On hearing that Fr Liam would no longer be involved with this group the Holy Father appointed an official to ensure that someone would be appointed to continue this Chaplaincy work. Fr Liam’s long missionary career of nearly 48 years of dedicated service came to a close when a worsening arthritic condition forced his return to Ireland for surgery. After recuperating from surgery he retired to Blackrock Road. At the weekly Sing-Song in St Theresa’s Fr Liam loved to hear The Rose of Mooncoin about his beloved Kilkenny. He took part in the weekly Lectio Divina prayer session until recent weeks. He was also proud of his cousin, the late Kevin Heffernan of Dublin football fame though his own loyalty on the sporting field was always with the Cats. Fr Liam is deeply mourned by his sisters Maureen and Sr Breeda, brothers Tommy and Martin, his sister-in-law Anna, cousins, nephews, nieces and wider family circle as well as his confreres in the Society of African Missions and many friends, particularly in Nigeria.